5/7/16 – We’ll be back on Tuesday, guys! I spent most of the week finishing a last minute TCAF project and I’m still kinda stressed about health stuff so I wore myself out :’). I promise we’ll be back to normal soon! We’re back! Between a week long internet outage and some cruddy health stuff, it’s taken me a bit to get back up to speed. Just so y’all know things may still be a bit bumpy update-wise as I’m gonna be at TCAF next weekend, and I’m working on a last minute thing for that. I’ll be posting some announcements on that next Tuesday! ‘Oh! Fish’ huh? That guy knows how to market a product. This page in particular looks really really good! Especially that top panel, it’s rather eyecatching! “Buy my Junk”, “Oh! Fish”… These are some shrewd bussinesmen. 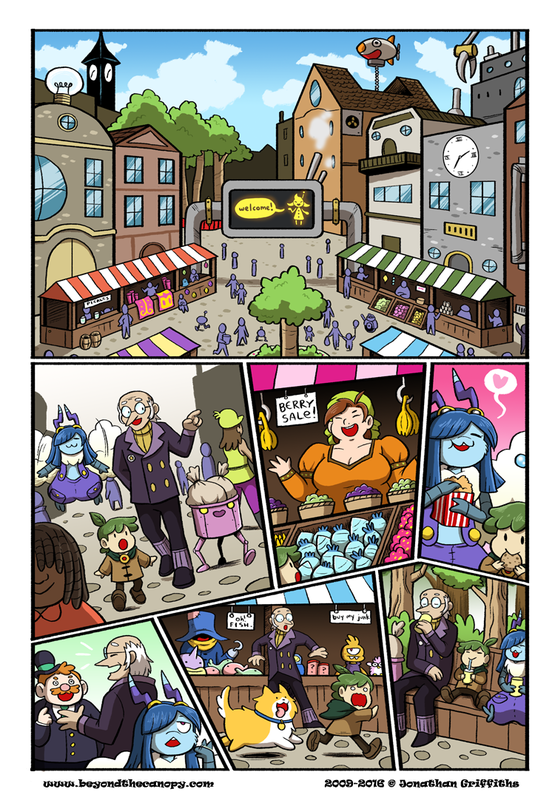 These freakin shops.. I’ve said it before, but this comic is everything mine tries to be. I love it. You have a webcomic? What’s it called? If you click on ColdFusion’s name, the browser will take you there. The town welcome sign is adorable. So Glen issued a discreet “FrootFroot” in panel 3 right? well. Thats ONE way to draw backround people. Did anyone see the blimp from Kirby in the background of the first panel? Out of curiousity what is this place part of?